The Game Academy was founded in 2016 to demonstrate that role-playing games can build resilient children and create lifelong learners. Thanks to the support of The Game Academy community of parents, friends, and families, this grand experiment succeeded! The Game Academy is excited to announce its first-ever end-of-year donation drive, launching on Giving Tuesday (November 27th). The Game Academy creates and supports game-based education that empowers life-long learners to achieve academic, social, emotional, and personal success. They engage imaginations with tabletop Roleplaying Games and LARPS (Live-Action Roleplaying Games), wherein 21st-century skills such as collaboration, communication, creativity, and critical thinking are the keys to unlocking adventures in learning. Parents and children alike are reporting the positive influences of our programming, and our intention is to continue to serve our communities with the same level of quality and commitment we have shown from our very beginning. Not all children can afford to access this important resource. No matter their family income, ALL students at The Game Academy benefit from a sliding scale. Your donation will also help develop curriculum to be used in the classroom by educators, extending The Game Academy’s benefits beyond the organization. In 2018, The Game Academy Community’s new goal is to give ALL children access to these resources. Let’s come together around this commitment. Our objective in raising these funds is to serve a DIVERSE group of students from diverse backgrounds. Students served will demographically represent the community we serve. Donors benefit too: Unlike fees for services, your end of year donation is 100% tax deductible. Annual fees collected total $60,000 for services that cost $80,000. This means it’s up to The Game Academy Community to raise the $20,000 shortfall – as well as funds to expand the program for children who can’t currently access it. The Game Academy Community’s 2018 End of Year Fundraiser goal is $30,000. That number includes the $20,000 shortfall, plus $10,000 to provide access for students who would OTHERWISE not be able to participate. As a grassroots organization, all funds donated to The Game Academy are directly applied to benefit local programs including year-round programming in our community. Your dollar translates into operating funds – the backbone that keeps our doors open and our programs up and running. Your donation also increases participation by underserved children. Every child deserves access to social, emotional, and academic skills. In order to move forward without increasing rates and pricing out the families we wish to serve most, we will be depending increasingly on our network of invested community members and those that wish to support our important work in the community. Please contribute to our team fundraiser for The Game Academy’s end-of-year general fundraising drive! Any size donation is appreciated. 100% participation is more important than size of donation. The Game Academy’s curriculum is designed to help players make enduring connections between what they know, what they are learning, and what is possible. Also, it’s a lot of fun! Self-reflection: The Game Academy provides an engaging and enriching way for children to play in a structured, creative environment. They craft inspiring, immersive game experiences that translate into powerful tools of reflection for understanding the world and the self. Neurodivergence: The Game Academy works with children of all backgrounds and is especially well suited for children with learning and social-emotional difficulties, such as children with ASD, ADHD, as well as many other conditions. Overcoming barriers to learning: Ultimately, we design interactive learning experiences that engage a diverse array of learning types, including “at-risk” or otherwise “disenfranchised” learners. Our games promote social, emotional and cognitive development while inspiring empathy, critical thinking and a collaborative spirit. From this enriched context for learning, we provide powerful learning experiences for players of all ages, backgrounds and interests. Our purpose is to provide an overall framework of reference for the activity of role-playing games, and to build a community of practice in which our learners become creators, and work together as a community toward mastery of the related activities and concepts. Social supports: Through collaborative storytelling, our participants find a safe community of peers where they can be themselves and feel safe to take chances and express themselves in a supportive environment. Your donation will help fund the mission of The Game Academy and will extend their reach to more children around the Bay Area and beyond. 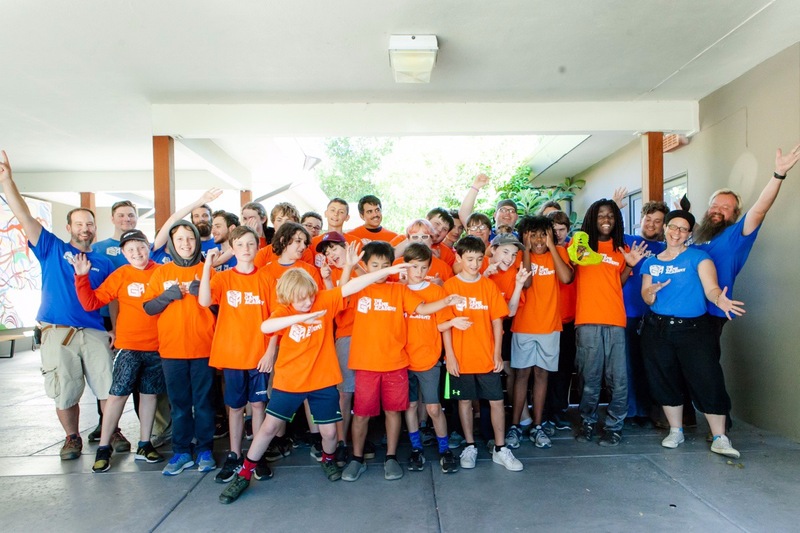 Currently, The Game Academy is offering programming in the North Bay (San Rafael), the East Bay (Berkeley), and Contra Costa county (Concord), and is expanding into San Francisco, Sonoma County, and farther south on the East Bay side. Common Core alignment: The Game Academy believes in the empowering and transformative effects of interactive Role-playing Games. Its vision is to bring this uniquely effective mode of education into the mainstream for learners and educators alike. The Game Academy develops Curricular Units that are Common Core aligned and adaptable to classroom and/or home-schooling environments. Programs: The Game Academy offers After-School Enrichment Programs, which focus on the social and emotional development of our participants. It also offers Summer Adventure Day Camps, which blend RPGs with project-based, hands-on learning in a stimulating and immersive setting. Our multi-tiered approach: As learners develop a deeper interest in one or more facets of role-playing games, we can work with them on furthering their own ideas and projects, whether it be storytelling, the creation of gaming artifacts, or the development of gaming narratives and supplements. We have an opportunity to shepherd these creative endeavors and even help the learners to produce, design, develop and perhaps sell their own game-related goods and services. Part of our philosophy is to build a guild-like, multi-tiered approach toward mastery, and promoting engaged and motivated learners from participants in the program to assistants, game masters, and game designers is part of our overall plan. Moving from experiment to learning laboratory: As a non-profit that strives to reach an increasing number of communities and children, The Game Academy has been operating with the grace of donated time and energy by most of our passionate staff. In the face of tight fiscal resources, we have nonetheless continued to grow. This last year alone, we have grown by 50% over the previous year’s numbers, in enrollment for both our year-round enrichment programming, as well as for our summer camp. Not only have we continued to grow in our San Rafael and Berkeley locations, we are also executing on plans for expansion into surrounding communities, such as San Francisco, Concord, Santa Rosa, Alameda and San Mateo, and continue to develop collaborative relationships with operating schools throughout the Bay Area. 2019 marks the year in which The Game Academy shifts from grand experiment to learning laboratory, building the infrastructure that entails. Our request to The Game Academy Community: Our fundraising goal for this drive is $30,000, which will significantly help us meet our operation goals and continue to provide our excellent programs at affordable pricing. This is a first-time effort for us, and we have been consulting with individuals experienced in fundraising in order to develop a solid plan that will lead us to success. It will, however, require help from our committed community to reach our goal. In brief, we are asking you for your help. We are seeking parent volunteers and donors to help us fundraise for The Game Academy. Any size donation is appreciated. 100% participation is more important than size of donation. Thank you so much for your generous contributions so far. Those that have given, have been generous and I cannot communicate how much it means to me. We are still far from our giving goal, and without reaching our numbers, we run the risk of not having the amount needed to operate throughout the year. If we can meet our giving goal by the end of our January drive, we will be able to focus on our programs and service instead of worrying about meeting our budgetary numbers. If we do not, we will of course continue, but will be needing to run a supplemental drive in the Spring. Please do what you can to increase the reach of our donation pool. Let your work know how fantastic it would be for them to support our cause! Tell your friends and family over the holidays the unique opportunity they could be helping to provide to children in the San Francisco Bay Area and beyond! Without the help of our community, we will fall short of our ability to meet our mission and goals. Thank you all for your help, contributions, and evangelism.